For the latest equipment and event planning resources, visit our new website, National Event Pros. Looking for a specific piece of equipment? Use our equipment search tool at National Event Pros. Our popular 30-ft. obstacle course comes in over 20 different themes to choose from. This obstacle course has 7 different elements and is a challenge for participants of all ages. Two at a time race their way through tunnels and obstacles and then slide their way to the end. 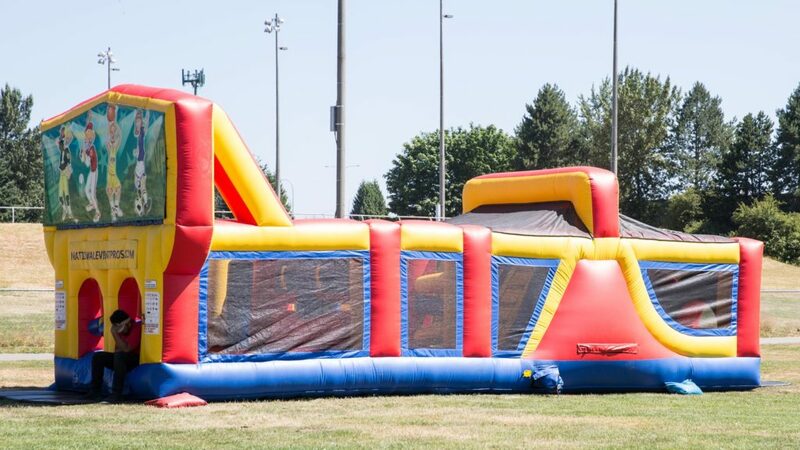 Perfect for all types of events in the greater Seattle area, including company picnics, school carnivals, and corporate events. Contact us to learn more or request a quote for your event. Send me updates about event planning resources. I appreciate your professionalism and clear communication. We had over 600 people at this event! I look forward to doing business with you in the near future, Thank You! Clowns Unlimited has been providing young-at-heart adult and children's activities for our company picnic and other company events since 1985. They are always on the cutting edge of cool and are extremely dependable. I can rely on them to provide imaginative fun, professional staff and safe activities whether it's for a group of 30 or 30,000. Thank you so much for the wonderful job you did at our Family Fun Night. You were so organized and quick with the set-up and take-down of your inflatables. Your crew was especially kind to the children, and they were careful to make sure that no one was injured. Even with the large crowd we had, your employees always smiled and kept the lines moving along. What if I need a bouncer tomorrow? If you need a bouncer today or tomorrow, or sometime soon, give us a call at (800) 763-3236! We will do our best to accommodate you. Availability may be limited, but we’ll do our best to meet your needs. Delivery area includes: all of Seattle/Eastside area including Seattle, Bellevue, Redmond, Kirkland, Woodinville, Duvall, Carnation, Monroe, Everett, Edmonds, Shoreline, SeaTac, Burien, Tukwila, Renton, Kent, Lake Forest Park , Mountlake Terrace, Brier, Lynnwood, Issaquah, Sammamish, Fall City, Snoqualmie, North Bend, Preston, Des Moines, and more. Located in Seattle, WA, we proudly serve Seattle, Bellevue, Redmond, Kirkland, Woodinville, Monroe, Carnation, Duvall, Snohomish, Lynnwood, Edmonds, Everett, Marysville, Arlington, Mt. Vernon, Bellingham, Renton, Kent, Federal Way, Tacoma, Lakewood, Olympia, Covington, Issaquah, Sammamish, Fall City, Snoqualmie, North Bend, SeaTac, Tukwila, Burien, Mountlake Terrace, Brier, Puyallup, South Hill, and the rest of Puget Sound. We also serve churches and schools throughout Washington. © Copyright 2015 Clowns Unlimited Inc. All Rights Reserved.